There’s no way in hell this crazy combination of vegetables and spices should work as a salad – and yet it does, and does so beautifully. What it is: A kale, cauliflower, raisin and wheat berry salad. Worth it: Yes, all this actually works. On the surface of things, you might expect a salad made from cauliflower, wheat berries, kale, canola oil and raisins to be a true disaster. None of those things seem like they should work well together – let alone when combined with curry powder – and yet the whole salad executes beautifully. 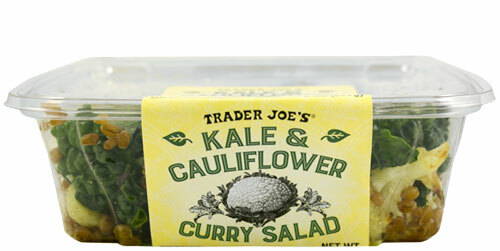 In fact, this is probably the most daring salad that Trader Joe’s has ever put out. On top of the eponymous kale and cauliflower, you also get a whole army of wheat berries, a scattering of big, sweet golden raisins, a liberal drenching of canola oil and, to top it all off, a “curry” salad dressing that isn’t actually curry flavored, at least not if you expect curry to be at all spicy. A better description would be “arid and pungent turmeric sauce”, because what it lacks in spice or complexity of flavor it makes up for in a potent turmeric punch. And the weirdest part is, I’d go back for seconds. Honestly, no one is more shocked than me. I’ve been completely grossed out by a couple of Trader Joe’s more recent, “hip and daring”, salad developments – notable their divisive Kale and Edamame Salad, and their offensive bulgur and carrot salad nightmare. What is it that this equally out-there salad gets right? For me, it comes down to one thing – the wheat berries. Wheat berries are nothing more than whole wheat kernels, and when soaked and added to salads provide a sort of satisfying, chewy toothsomeness and mild nutty flavor. In fact, one of my all time favorite Trader Joe’s salads – Trader Joe’s squash, quinoa and wheat berry salad – makes similar good use of this wholesome grain. Although they don’t get top billing here, wheat berries make up the bulk of this salad – providing the binding agent that holds together the piquant curried cauliflower and intensely robust kale leaves. 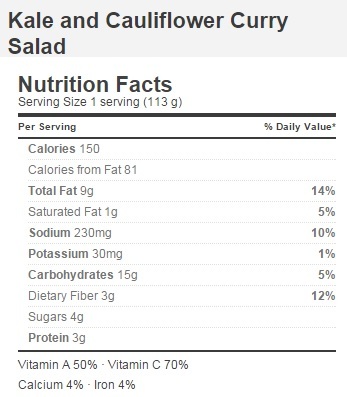 In fact, kale is more of an accent vegetable in this salad than the backbone. A few shreds of kale leaves hang out alongside the crunchy cauliflower – deep green, uncooked to the point of toughness, and tasting almost aggressively nutritious. If you’re looking for more roughage in your diet, this kale is eager to provide it. The cauliflower is its typically mild and roughly textured self, but without the springy, soft wheat berries to pad out the bites in between the two vegetables this salad would be a much less tasty experience. Not to be overlooked, of course, are the raisins. Providing interesting bursts of sweetness to the otherwise beige-tasting affair, the raisins work brilliantly with the tumeric dressing and compliment the mild wheat berries perfectly. Despite everything that’s going on in this salad, it’s not so much of a taste sensation as it is a texture experience. The flavors are bold, but not overwhelming. Far more notable is the vivid spectrum of textures that play across your tongue from bite to bite. If the thought of slippery wheat berries mixed up with strong ribs of kale makes you shudder, you’ll definitely want to give this one a miss. If you can get past that, however, this is a nutritious and wholly original salad perfect for shaking up your culinary routine. Would I Recommend It: Cautiously – this salad isn’t going to be for everyone. Would I Buy It Again: To my own amazement and surprise – I would. Final Synopsis: There’s no way this outrageous salad should work – and yet it does. So delicious! I added my own pumpkin seeds and a protein! i realize that this is a cold salad but I poured the contents in a bowl and mic’d it. not bad but made more attractive to me because of the nutritional data. salt and pepper helps.